Are You Reaching Mobile Users? Is a Mobile App Right For My Business? The honest answer is – maybe – maybe not. Are you in need of a robust POS platform that allows customers to buy from your website? Do you need to build your own expensive platform that allows consumers to learn about your store at a glance with a video introduction, GEO targeting, retention features, and the ability to offer discounts? The answer is No. Solution: Thymbol’s Branding Page. Cost: As low as $100 per month. • A business powered and consumer inspired mobile app and web based discount site. • An autonomous business portal that allows managers to create digital coupons in real-time that is conducive to their businesses’ success. • An affordable way to reach mobile users. • A platform designed to help managers reach new customers and retain their existing customers. 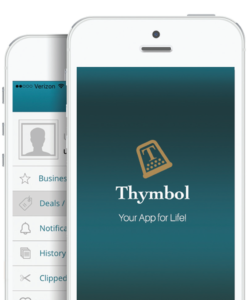 You are at the right place to learn more about Thymbol, just click on the Features tab at the top of the page.